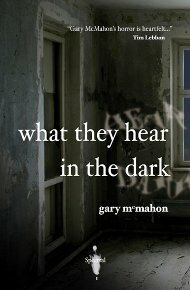 What They Hear in the Dark, the first chapbook from Simon Marshall-Jones’ new Spectral Press imprint, is a creepy little tale of a couple mourning the death of their son. To combat their grief, Rob and Becky have thrown themselves into a renovation project, restoring a run-down old house to its former glory. The theory is that as they plaster over the cracks in the building, they will also repair their own fractured relationship and fill the aching void in their lives. Needless to say, it isn’t working. However, they have found what, at first, looks like an interesting distraction. The ramshackle house contains a room that shouldn’t be there. It’s not on any plans and makes no architectural sense. And that isn’t the strangest thing – not only is the room structurally impossible, it also somehow absorbs any sound. Within those uncanny four walls, silence is king. For Becky, the silence of the Quiet Room is a comfort, helping her find literal peace, but Rob isn’t so sure. Is there something else lurking in the silence, something linked to their son’s murder. Gary McMahon‘s unsettling tale is a fantastic start for Spectral Press. Like all good ghost stories, the events are left somewhat unexplained, forcing you to fill in the blanks and the very concept of the Quiet Room is chilling and claustrophobic. This is understated horror, which never resorts to blood and gore, upsetting your soul rather than your stomach. The underlying menace at the heart of Tom and Becky’s dilapidated house will stay with you long after you’ve put down the rather handsome little publication. The best short stories leave you longing to find out more, and this is certainly true of What They Hear in the Dark. McMahon could easily return to explore the terrible silence found in that inexplicable room and I for one will be returning to the Spectral Press for more ghostly goings-on.